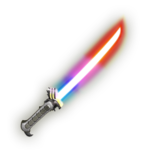 The Beam Sword, also known as an Energy Blade, is an item in the Super Smash Bros. series. In Super Smash Bros., the weapon was composed of a long pink blade of energy and had extremely long reach. The Beam Sword can also be thrown as an excellent projectile weapon for moderate damage. A thrown Beam Sword would also knock the foe back quite a ways. In Super Smash Bros. Melee, the Beam Sword has purple hue and its blade is shorter. However, the length of the blade changes depending on who picked the weapon up. The size also changes according to the strength of the attack – a Smash Attack gives the blade its maximum length. Throwing the Beam Sword results in minimal damage in this game, as well as a severely reduced knockback. The Beam Sword returns in Super Smash Bros. Brawl, where it takes on a new bluish-white hue; in this game, however, when used with a smash attack, the sword extends, allowing for the weapon to have a longer range. Beam Swords reappear in Super Smash Bros. for Nintendo 3DS and Super Smash Bros. for Wii U with a new design. The blade has a shape most similar to that of Super Smash Bros. Melee, as well as graduated colors of red and blue. Unlike in Melee and Brawl, the length of the blade is constant between characters. The Beam Sword reappears in Super Smash Bros. Ultimate, retaining its appearance from Super Smash Bros. for Nintendo 3DS / Wii U.
Beam Sword With its distinctive glowing blade, the Beam Sword is eye-catching and lethal. At first, the blade is about the size of a short sword, but the length changes depending on who wields it. The blade also lengthens in direct proportion to the power of an attack, so it reaches its maximum size when swung as a smash attack. N64 Super Smash Bros. A sword with a blade of glowing energy. The length of the blade changes depending on the fighting spirit of the wielder. It has four attacks: a standard attack, a strong side attack, a side smash attack, and a dash attack. When doing a side smash attack, the beam sword's blade grows to three times its normal length--that's the best reach of all battering weapons. Wii U Super Smash Bros. for Wii U A powerful sword with a blade of pure energy. It isn't the strongest weapon to land on the battlefield, but its shape can change based on how it is used to attack. A forward smash will make the blade especially long. Lash out at your foes from a distance–they can't hit back! The Japanese versions of Super Smash Bros. and Super Smash Bros. Melee had sound effects for the Beam Sword that were similar to the ones used by Star Wars' Lightsaber. The sound effects were changed during their localization, although Super Smash Bros Brawl and Super Smash Bros. for Nintendo 3DS / Wii U retain the sound effects. This page was last edited on March 19, 2019, at 07:22.